I recently had the opportunity to try out a Wacom Bamboo graphics tablet, having purchased one for my Dad this holiday season. Dad is not a graphics guy by any means, but I use my Wacom tablets for so much more than just drawing and graphics applications – and love it so much – that I thought the Bamboo was a perfect accessory for another ardent computer geek. In short, the Bamboo is a great entry-level tablet for casual users, but graphic artists will want to seriously consider investing in one of the pricier, but more fully-featured Intuos3 models. Read on for full details. Out of the box, this thing impresses. Looks very slick, and is amazingly and significantly thinner than the Intuos3 series graphics tablets. Also, the non-active area around the tablet is much reduced, although it may be an optical illusion based on the differing placement of the buttons and scroll area. The scroll area is round, as opposed to the vertical Touch Strip on the Intuos. I don’t like the Intuos3’s TouchStrip, and found the round touch-sensitive scroll area on the Bamboo to be much more ergonomic. The Bamboo has a unique pen as well, about the same thickness as the Intuos3 stylus, but shorter. It has a decent weight and balance to it, but here I prefer the Intuos3 stylus. Driver installation was a breeze – the software doesn’t even require a reboot on OS X. Otherwise you just plug it in to a free USB port and you’re all set. One nice feature on the Bamboo that I wish my Intuos had: a detachable USB cable. Nice touch, and I have no idea why the smallest model in the Intuos3 series doesn’t follow suit. Not a deal-breaker for the Intuos3, but cool nonetheless. I let Dad play around for a while, a bit (understandably) bewildered. Using a graphics tablet takes some acclimatization; I usually recommend using for at least an hour a day for about a month or so. Your mind & meat need to get used to the mechanics of the new device. I swear by ‘Pen Mode’ , where the area of the tablet is matched exactly to the area of the monitor. There’s also ‘Mouse Mode’, where the tablet acts just like a mouse – you can lift away from the tablet surface and drop the stylus back down in another area on the tablet, and the pointer stays where you left it on-screen. Dad seemed to prefer Mouse Mode, but I think that preference will soon wear off. It probably helps with the transition, however. When I finally had my chance to play with the Bamboo a bit, the first glaring difference I noticed was in the material used for the tablet surface itself – much less silky than the Intuos3 surface. Not bad by any means, but after using the pro series, it’s very noticeable. It reminds me very much of the surface on the old Wacom tablet I use at a contract client’s office who still uses G3 computers (and OS9!) – those older tablets need Apple’s old ADB/serial port that is now (thankfully) discontinued on Macs in favor of USB. I’m not sure of the exact model, but it was not a pro series for sure. Probably an equivalent to the niche the Bamboo now fills. Another major difference was the driver software. I was quite surprised to see that the Bamboo driver software does not support application-specific settings as does the Intuos3 series. You can set sensitivity settings and customize the stylus buttons, but these are applied system-wide. Not a major issue, but for customization geeks like myself, this is a limiting feature. Per-application settings for stylus button functions and pressure sensitivity is handy for those instances when you want it. For the target Bamboo customer though, probably fine. The driver software also required you to set everything with sliders, as opposed to the small “scratch pad” area on the Intuos3 driver which would interpret your actual stylus usage and set the sliders automagically. I thought to myself that Wacom should incorporate the advanced Intuos3 features in the preferences – but gray them out so users would know what other features are available with the high-end models. Otherwise, the Bamboo was quite impressive, especially considering the price point. I went with the bare-bones version because I knew the Bamboo Fun’s mouse would never be used, and the Bamboo Fun also didn’t look a sleek as the standard version – the rounded edges make it look too toy-like. With a lower pressure sensitivity than the Intuos3 series, you have to allow for the inherent differences. 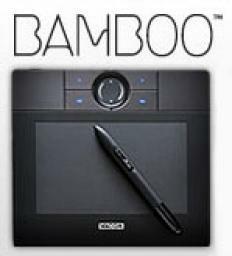 But for basic, casual drawing and photo retouching — as well as general input device usage — the Bamboo delivers. If you are a graphics professional, or prefer more customization with your tools, I highly suggest spending the extra cash to get an Intuos3 series graphics tablet instead; it’s well worth the price jump. However for the basic, occasional use — or for an introduction into the world of graphics tablets — you can’t go wrong with the Wacom Bamboo. I’m considering buying a Graphic Tablet very soon. I know the WACOM line has quite a reputation. I’d like to know if there are any other cheaper alternatives for the illustrator/graphic designer on a budget. If I have to fork out the cash to get the 6x11Inutos model…I guess I’ll just have to so that. I’d really like some advice on any other alternatives is possible. Also do you have any recommendations for a similarly priced camera, to do graphic design reference work? As far as a cheaper tablet, it seems Wacom has positioned the Bamboo as the replacement for the Graphire series, so the Bamboo is really your least expensive option. At around $60 for the basic Bamboo, it really is a decently-priced introduction to graphics tablets. You mentioned the 6×11 Intuos, but also consider the 4×6 Intuos as well. The size of your monitor does play a part in the size of the tablet you’ll want. A larger tablet will give you more “play” as far as how sensitively the tablet reacts to your movements (particularly when using in ‘pen mode’). Since the tablet area is mapped to the monitor, a smaller tablet will amplify your movements since you can move the stylus much further across the screen with smaller movements using the smaller tablets. Also, if you have a widescreen or dual-monitors, you’ll definitely want to go with one of the widescreen models. I have seen other manufacturers who create graphics tablets, but know very little about them and have never used anything but a Wacom. The differences between the the Bamboo and the Intuos series are significant, and as I mentioned in the post I really recommend going for the Intuos if possible. However, the Bamboo is also a nice piece of equipment, and will get the job done. The real question is: since the Intuos is more than three times the price of an Intuos, is it that significant of an increase in the quality and functionality of the product? I say yes. If you go with a Bamboo, you’ll think “this is a great tool”. If you go with the Intuos, you think “this is a phenomenal tool”. If your budget is playing a significant factor in the purchase, the Bamboo may be the better choice. However, if you use grpahics software quite a bit, I really think the investment in the Intuos is well worth it. Believe me, I was hesitant to fork over the cash for the Intuos, but the instant I used it for the first time, I stopped thinking about the money I spent altogether – it’s that good. It’s a tough call; I hope this helped out. P.S. – You may also want to check out my full review on the Wacom Intuos, might have some additional info there that will help you decide. @destinycreature: Glad to hear you took the leap to get the Intuos3, and that you are happy with the purchase. It sounds like you had the same experience I did when first using the Intuos3 – it really does blow you away with it’s excellence as a product. Thanks also for posting back with your experiences, I am sure it will help other graphic artists who might be inclined – due to price alone – to go with a Graphire/Bamboo instead of investing in the much superior Intuos3. The Intuos 3 did indeed feel silky-smooth, and you can definitely tell the difference in resolution between it and the Bamboo. However, I have had constant issues with it on XP since I installed it, despite reading/trying/downloading new drivers. It turns out this is a pretty common problem with the Intuos 3 on all platforms. If you remove the pen from the tablet, it can’t always recognize it when you go back. You have to tap several times before it comes back. Some say it’s a faulty pen issue. I’ve emailed Wacom but they haven’t written back. And it’s significantly weightier and larger too. I can’t slide the 4×6 Intuos 3 into my laptop sleeve like I can with the 4×6 Bamboo. Furthermore, I decided that I’d be too “precious” with my Intuos to risk carrying it around in my laptop bag. I like the cheapness and portability of the Bamboo, which fits the bill better for me, and which I’ve dropped plenty of times with no ill effects. So… I ended up ordering a replacement Bamboo pen for $29, and am planning on returning the beautiful but erratic Intuos today. I actually don’t have any problems with my tablet, using it on XP an all. Maybe you can try getting a different version of XP with all the patches and stuff. The automatic downloads slow down your system, takes up your had drive space and eventually ruins your computer with all kinds of errors.The weight and size is something that you grow accustomed to, its not like having a sketch pad sitting on your lap. Many people warned me about buying a 9×12 tablet and told me to start off with a lighter series like a Graphire. But In less than 2 nights I got the hang of it and its been a great help. People who draw are usually the ones who would have an appreciation for this type of tool. There is so much you can do with it. The long chord comes in pretty helpful if you’re using it on a desktop computer or in other situations. I also use a wireless mouse and keyboard which helps a lot. Well if the Bamboo works for you, I’m happy. That’s a shame you had so many problems with the Intuos3 on Windows – is it XP or Vista? I am using OS X myself, so I am not familiar. I am also surprised to hear you had trouble with Wacom support – they have usually been timely (although not fast) with support, and even replaced things for me free of charge at times. I agree – the Bamboo is much thinner and more portable, and the detachable cord is something that should be considered for the smaller Intuos3 lines. The 4×6 Intuos3 fits fine in my laptop bag with my MacBook, and I picked up a neoprene Wacom case – http://direct.wacom.com/stores/5/Intuos3_4x6_Travel_Bag_P1028C65.cfm – to ease my worries about damaging. Also, I use a Cable Yo-Yo cable organizer – http://www.bluelounge.com/cableyoyo.php – to keep the cord tamed. However, the Bamboo is still a great little tablet, and to be honest I reconsidered the need for an Intuos3 for the laptop since I am in front of the MacPro 90% of the time – that’s where I definitely like having the Intuos3. But for intermittent laptop usage, the Bamboo might have sufficed. The Bamboo wasn’t available at the time I purchased, and the Graphire series just didn’t appeal to me. I was also more mobile at the time with contract work. The real shame is that the replacement pen cost almost half of the price of the whole Bamboo! Sounds like destinycreature hasn’t had any issues on Windows – at least under XP. I called Wacom Tech Support today and they were helpful and offered to send a different pen. It turns out the pen with the serial number 8C and lower is the one with the problems I described, which have occurred on all platforms from Linux to OSX to Vista to XP, according to all I have googled. Wacom is aware of this and recommends buying a pen with a number higher than 8C– like 8D or 8E. But I opted to just return the Intuos anyway, because I think the portability, size and weight of the Bamboo makes it more suitable to my needs right now anyway. I can definitely feel the difference in quality between the two, but overall, portability wins. That’s interesting, I would have never guessed the pen could cause so many issues. good to hear you got it sorted out & Wacom took care of you. I have recently purchased the bamboo to replace my graphire after my puppy ate the cord. I like the bamboo with one exception, it doesn’t have the eraser function that the previous one had and I find this a major drawback. Do you know if there is a driver that can solve this problem? The Bamboo does have the eraser like other Wacom models. Maybe you just don’t have it configured properly…? I use the eraser in Photoshop and Artrage with my Bamboo. Joel — as Amy mentioned, there should indeed be an eraser function. My guess is that you had the driver installed for the Graphire, but have not installed the driver for the Bamboo. I would suggest downloading the newest driver for the Bamboo and see if that clears up your eraser problem. Amy and George, thank you so much. I followed the link and updated the driver and now I have my beloved eraser back. I thought it was weird that the eraser was physically there but just seemed to work as a second tip. I had repeat idly tried to update the driver using the control panel but it kept telling me I had the best driver installed. Lesson learned. When you want to update a driver, do it at the manufacture’s site. Thanks again… now I’m happy with my Bamboo. Glad to hear you’re back up and running as normal on the Wacom. So does the Bamboo allow pressure sensitive calligraphic brush strokes in Illustrator? My friend has a Bamboo on her Mac but Illustrator’s “pressure” setting is grayed out. Sounds like your friend may need to contact Wacom and see what the status is on that issue. I can confirm that calligraphic brushes in Illustrator work fine on the Intuos3 under OS X 10.5.4 Leopard. Hi–thanks for publishing this info! I’m considering buying a graphics tablet, and am very glad to have the benefit of your experience. However, there’s one question that I haven’t found an answer to, yet–if a person wants to try out graphics tablets without buying them, is there any retail chain that would be likely to have them sitting out for demonstrations? I would be using the tablet for occasional (and, so far, amateur) cartooning or art experiments. Price is not a big factor for me, but time and ergonomics are–I have a busy life and repetitive strain injuries, so I’d really like to be able to go somewhere and experiment, rather than ordering and sending back. Karen — I would suggest dropping Wacom a line. I wanted to do the same thing, but with one of the Cintiq models (with the built-in screen). Wacom directed me to a retailer that had demos available, unfortunately for me the closest one was pretty far away. I can tell you that using a tablet (for me at least) is far more ergonomic than a mouse. But I can see how you’d want to try it out for yourself. Wacom should be able to point you in the right direction hopefully. Thanks very much, I’ll give that a try. Best of luck with whatever you are working on!